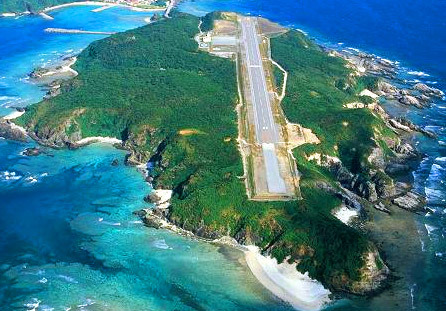 This entire island is used as an airport, acting as an entrance to the Kerama Islands. A shuttle-bus service runs between the airport and Zamami. Fukaji Island, which is not inhabited, is also well known as a place where sea turtles lay their eggs. Neighboring Mokaraku Island is a favored diving spot. There is also a plan to extend out the runway on Fukaji. There is a small small through to near the entrance of the airport building of Kerama Airport, soon will arrive to vantage gazebo and follow this small way. Kerama airport was approved for developmentconstructed as a non-public airport under the construction and management of a private company, Kokyo Shisetsu Chizu Koku, in February 1982.